One of the biggest disappointment when I migrated to my MacBook Pro is its built-in speaker. Although the left and right speakers sound above average, they still can’t be compared to my old PC laptop. That’s why I spent some time to look for a good external speaker for my MacBook, but I failed because most of them are not designed for Mac or the prices are too expensive. I gave up and unexpectedly, Logitech sent me the Logitech Z600 for reviewing. The speaker has been available since July 2013 and it has received a lot of positive reviews on Amazon. That’s the reason why I am so exited to try it. The product is sponsored but the review is 100% my opinion. Let’s check it out. I got the white Z600 speaker and it looks like a great complement for my MacBook Pro. Watch my unboxing video and some product images below. The 2.0 speaker won’t take much space on your desk thanks to its small footprint. The standing cylindrical design looks really great when I place it alongside my MacBook, I believe it is also suitable for Mac and other white PCs, laptops. All controls for the system are put on right speaker. There are a Bluetooth pairing button, a Power button, an 3.5mm AUX input and a mini-USB port to update firmware on the back of the right speaker. I was a little surprised when I couldn’t find the volume control, then I figured out that it is placed on top of the speaker. You can easily adjust volume by touching and gliding your fingers around edge of the top, clockwise for volume up and counterclockwise for volume down. It is just like an invisible control knob. The Logitech Z600 could easily pair with any device. In case your PC/laptop is too old and don’t support Bluetooth, there is a USB Bluetooth transceiver in the box to help. Even when your device doesn’t have a USB port, you still can use the provided AUX cable to connect to the speaker. Another feature I love on this device is the fast switch between devices. The speaker allows up to 3 devices to connect at the same time. I easily can switch to another device without disconnecting and then reconnecting, just stop on a device and play on the other device. The Z600 features 3 drivers on each speaker and it is promised to deliver rich bass, and strong mids and highs. Check out the video I recorded below, the reproduced sound can’t be accurate but you could get an idea what you will experience. My first impression is that the speaker is better than most 2.0 speakers I used before. The mids and highs are quite good and the bass is strong enough to shake stuffs on my desk. When I turned to maximum volume, sound from the Z600 easily can fill up my room. However, I also saw some drawback of the speaker. The bass response is good but it is not rich and deep enough. I just can realize upper bass most of the time. The Z600 seems to emphasize on the upper bass because it doesn’t have a subwoofer. This design makes the bass stronger, but also makes the overall sound flat. The midrange sound also loses some details and honestly I didn’t enjoy listening to music on this speaker. Beautiful and clean design that looks great beside your Mac. Bass response is above average compared to other speakers. Treble sound is good and clear. The sound is very loud when turning to maximum volume. There is almost no broken and distorted sound. Adjusting volume on top of speaker is interesting and helpful. Overall audio is not impressive. Sound stage is disappointing, you will experience a dry sound. The bass is good but not deep. Midrange loses some details and sounds flat. You hardly can buy a good speaker for your Mac for less than $100. The Logitech Z600 is currently available for $99.99 on Amazon. With a sleek design, an acceptable sound and particularly, an affordable price, this is still a good choice in my opinion. 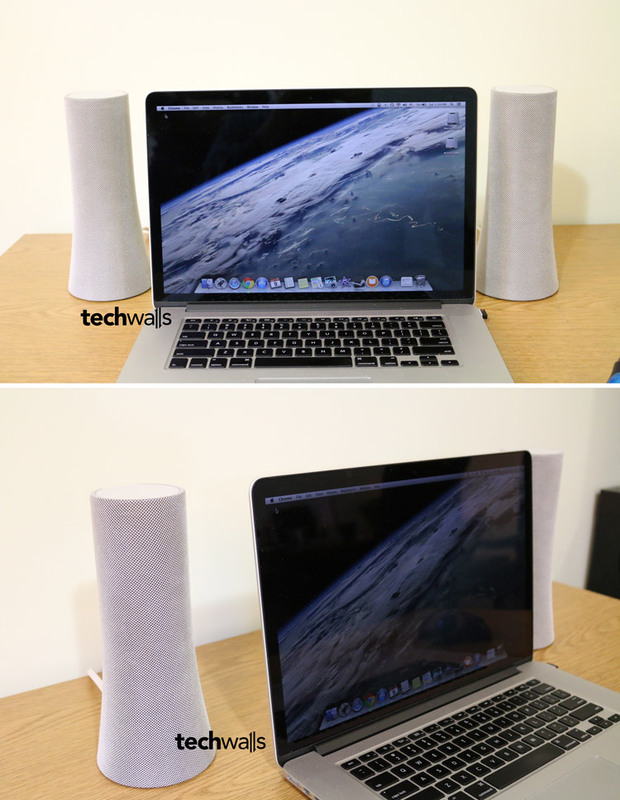 Beautiful speaker for Mac and MacBook.